Where has Delush been all my life? Why was I so anti-glitter for all those years? I’m just going to admit it: I want wrong an now I’ve seen the light. The glittery, disco-ball infused light. Delush’s amazing blue crelly with neon green glitter, “Turn over a New Reef,” is so fantastic that after painting on two coats, I immediately hopped online to go buy more from this brand. I was hooked that fast. This formula is great. Better than great. Pure perfection. Totally opaque at two coats, it’s some kind of magic crelly that lets the glitter shine through the base. No VNL at all at two thin coats. The glitter was so easy to deal with: there was no fishing necessary. The big and little glitters came out on the brush as cooperated nicely in spreading out on my nails. I love when things are this easy. Also square glitter. YES. I love this polish. It is so bright and fun, and it makes me feel so summery and exciting. The formula is absolutely perfection, which makes painting it on a joy and reminds me why I love indie polish in the first place. I give this a perfect 10 out of 10 all around. You can find this polish (and a great big range of other fun glitters) at Delush’s website. I found turnaround and shipping time to be satisfyingly speedy. I was also anti-glitter. Peel off base coats changed the game! Exactly! Finally getting a peel-off base emboldened me to try glitters and now I’m hooked! This is one of my all time faves from Delush. Everything from the glitters to the color is perfection. What a pretty polish! 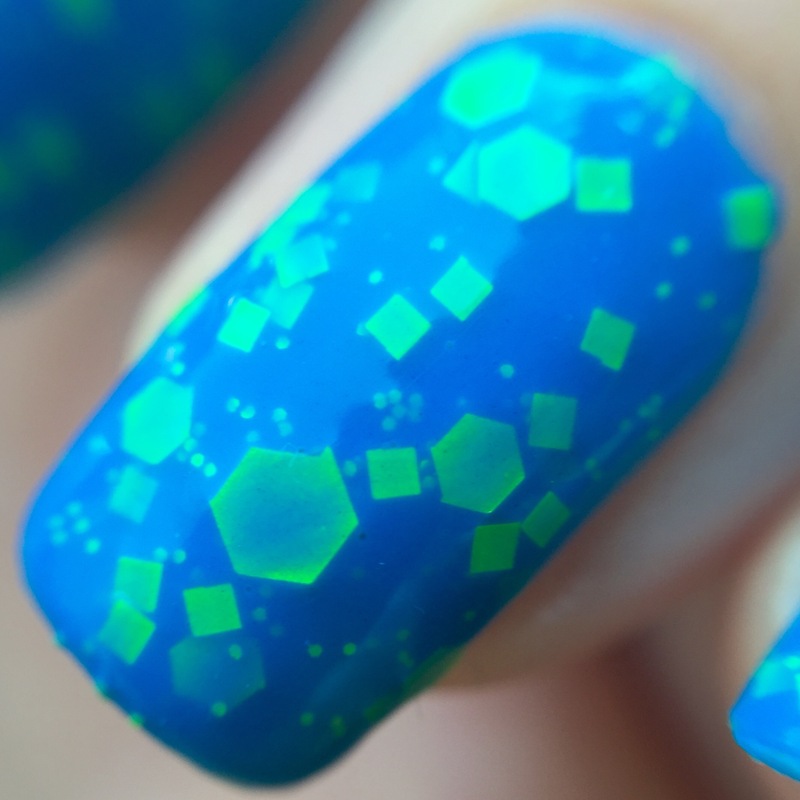 I could so see using this for some cute “under the sea” nail art! I love the colors in this but the different sized glitters are not my cup of tea for some reason. I cant put my finger on it and that’s driving me crazy. You do have amazing swatch photos though.